Есть вопрос для Smile House Chiangmai? Расположенный в самом сердце района Старый город, Smile House Chiangmai является идеальным местом для знакомства с городом Чиангмай. Отель расположен в 1 km от центра города и обеспечивает доступ к наиболее важным объектам города. Благодаря тому, что объект размещения находится в непосредственной близости от таких достопримечательностей, как Тонис Биг Байкс, Wat Phakhao Temple, Rendee Design, гостям несомненно понравится его удобное расположение. Smile House Chiangmai предлагает безупречное обслуживание и все необходимые составляющие для хорошего отдыха. Этот отель предлагает многочисленные услуги, которые могут удовлетворить даже самых взыскательных гостей. Smile House Chiangmai насчитывает 38 номеров, обставленных тщательно и со вкусом. Кроме того, многие номера могут похвастаться следующими удобствами: телевизор с плоским экраном, полотенца, Wi-Fi, Wi-Fi (бесплатный), номера для некурящих. В отеле можно найти полный спектр услуг для отдыха и развлечений, включая такие, как внешний бассейн, детский бассейн, сад. Smile House Chiangmai предлагает своим гостям все преимущества самого лучшего расположения и непревзойденное качество услуг. A very tired place indeed. The rooms are small & dirty, the bathroom was disgusting.About the only thing it had going for it was it’slocation, close to Thapae gate & the two walking streets. The place is run down and old, air conditioning stain on wall, clogged bath room, the pool is half broken (walkway), in general this hotel would look great 10 years ago but not now. I wish the owner all the best he/she probably have insufficient fund to upgrade the place but the photos are not what it seem. Rate cheap and you get what you paid if you are seeking for a place to sleep and nothing else. Although recommendation for this place was in a 2015 edition, the rot had obviously started years earlier. Absolutely minimum maintenance: plumbing, peeling paint, mould, rotten deck boards around pool ( serious tripping hazard. No water in the room halfway through our stay. (We were moved to another room). Beds give a bad name to what passes for a mattress. Sore limbs were only alleviated by laps in the pool, a minor saving grace. Best avoided altogether. 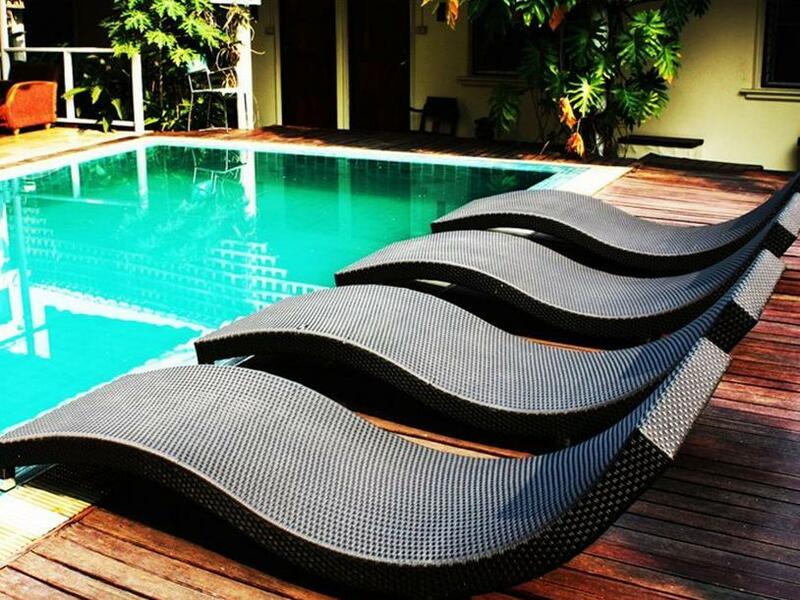 Lovely place to stay and relax, excellent location in heart of old city with car parking, very nice welcoming staff, swimming pool, room was clean an excellent place to stay and explore Chiang Mai, lots of restaurants near by. this guesthouse is rundown and dirty. bedding was full of holes and stains, rooms dirty, and generally the place needs some maintenance. Staff were friendly and helpful, but I was disappointed with my stay. wouldn't go back. Short and on point: It needs some renovation. It has a very good location inside the old town and therefore a high potential to be great, but it’s far away from this. It’s not really clean, very old, smells old, the wallpaper has a lot of holes and the shower needs some pressure adjustment. The fan hasn’t been cleaned for a long time. Still for us it was okay, because we didn’t spend much time in the room. Only for sleeping. I definitely know better ones in the old town for the same price or even less. Guys, hope you read this and renovate your rooms. When we came there were no towels in a room and they gave us towels only at evening. Next day there were no water in rooms for about 18 hours. They don't even give us free water in a room like many other places do. And only small piece of soap. Though, there's nice pool. Anyway, price is too high for such conditions. Booking this place was a piece of bad luck. Value doesn't correspond to price. It's shabby and dirty. Bathroom hasn't been cleaned, no toilet paper, no towels. The small toilet shower was ... how to put this diplomatically- untouched by cleaning for long time. Cockroaches were lazily hanging out in the dirty bathroom, undisturbed. Luckily the bedding was clean. Thanks heavens. Moldy cushions in the reception area do not invite to rest there. Dog poop in your way to room doesn't make things better. This place was probably quite nice when new. Glory long time gone, sadly. Staff is friendly and tries to be helpful. In conclusion, booking this place for 530 baht a night (AC room) was highly regrettable. Really basic room. Barely ok for one night of transit but not more. I was looking forward to a cozy night in this hotel but was sorely disappointed. My room was run down, parts of the trim were torn off, paint was decades old, fan didnt swing back and forth after the first few turns, window latches were broken, shower was very old and barely attached, etc... The bed seemed clean, which was its saving grace. I was up 3 flights of (small, slipperly) stairs near the laundry room. Junk was piled next to my room. Outside below (which isn't really their fault) was a mans yard with a chicken and a dog which traded off keeping me up all night/morning. Pool looked dirty and the other guests were loud an obnoxious. Normally I'm pretty understanding of some rough edges but for the price this just wasn't worth it compared to the other options out there. We really enjoyed our stay. Wifi works in public areas but we lucked out being just above the lobby and were able to get some wifi in the room. The room was nice and clean and the staff was super friendly. The only downside was that the toilet took forever to flush and never actually flushed completely. Even given that we would stay here again on our next visit to Chiang Mai. We really enjoyed the stay and found the location was perfect. Well worth the money we spent which was a very reasonable price for a private room with a double room and a private bathroom. We would recommend this to any traveler. Homely inviting lobby with friendly resident cats and dog. I had a room by the pool and close to the lobby. I slept very well and woke up happy. I was surprised they had an English movie channel as well on tv. As for the very comfortable partly open lobby/living area, they might do well to replace the seat cushions as they now sagged in the middle. Staff were attentive and helpful. Near eats, 2nd hand bookstores, market, big bike rentals. What a great place. We wish it were available for our whole stay in chiang Mai. The pool is clean and IN THE SUN, which was a rare find. Lots of people buzzing about, but a relaxing vibe. Didn't eat here. Rooms were spacious and clean. Helpful staff with better English than we have experience here. Stay here!! I have stayed here a number of times and always a pleasure. This is what i would describe as "back-packer plus". The rooms are adequate but not fancy - but reasonable for the price. I know that some reviewers are a but critical of the rooms but as said they are reasonable for the price. The pleasure of this place is the whole experience. The public lounge and pool side terrace areas are great for chilling and relaxing. The location is superb with everything you need within easy walking distance - especially John's bar just up the lane. The staff are friendly, speak good English and are very helpful. The Smile breakfast is always a pleasure - enough to keep me going till dinner time. There are some improvement required in the room I stayed. Weak wifi, water leaking air-con, moldy wooden floor due to air-con water. This is the first time I see a toilet built inside the room with no ventilation or window, and sharing the same open ceiling as the rest of the room. Location, proximity to good restaurants, pool. My wife and stayed at Smile on the advice of a friend and we were very satisfied due to the location and pool. There are many excellent restaurants nearby and it's a five minute walk to the start of the Sunday Walking Market and a variety of other in-city things to see and do. Also, our favorite breakfast cafe is just around the corner (called the Dada Cafe) and do try their cheese omelettes which are really great! The Smile House is slightly tucked away from the street and surrounded by trees and flowers. There are two very friendly cats and a dog that lounge around the premise, which I as an animal person, loved. The room my friend and I stayed in was cozy and clean. The only minor flaws I noticed was how thin the walls were- I was worried my friend and I chatting and laughing in our room was going to disturb the neighbors. Also, the pictures online show lounge chairs by the pool, but the chairs available did not fit that description. However, it rained during our free/leisure day so we couldn’t use the pool anyhow. Overall, it was a lovely little getaway & very centrally located to lots of bars, restaurants, shops, and more!